Some call it a temple. Some chose to call it the abode of saints who heal. To some, it's a last chance of survival. But to no one, is this just a hospital. In its genre, Narayana Hrudayalaya may well be one of the biggest hospitals in the world, but the fact that it’s one of the biggest hospitals, with a heart, is becoming legendary. The rich come here for the world's best heart care. The poor come here for the world's kindest care, for no one here is turned away for lack of funds. This was the vision of Dr. Devi Shetty, who believed that no child should be deprived of the best healthcare, because the parents cannot afford it. 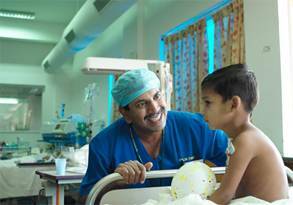 Caring with Compassion, this world's largest heart hospital for children, is set to be transformed into the world's biggest health city, with all super-specialities that the medical world offers. It’s a promise of the best healthcare, that brings succour to all, like the divinity of Narayana’s Vishwarupa, that greets everyone in the lobby of the hospital. Narayana Hrudayalaya is founded by one of the India’s oldest construction company “Shankar Narayana Construction Company”. 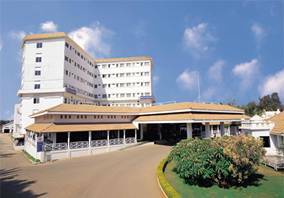 Narayana Hrudayalaya group has Narayana Health City at Bangalore covering 25 acres of land and Rabindranath Tagore International Institute of Cardiac Sciences in Kolkata and Rotary Narayana Nethralaya a Super Specialty Eye Hospital. Four years ago Narayana Hrudayalaya in association with the state government launched a Micro Health Insurance Programme called Yeshaswini, which covers the healthcare of nearly 3 million farmers and is considered as India’s largest Micro Health Insurance Programme for a monthly premium of 10 rupees. This programme now is launched in several other states in consultation with our groups. Asia Heart Foundation, which manages all our activities in Kolkata, runs the primary healthcare of entire Amethi constituency of Uttar Pradesh. Amethi is one of India’s largest MP constituency having 24 Lakh people and this is managed by 16 clinics created by Asia Heart Foundation with Narayana Hrudayalaya where Amethi residents come and see the doctors and get all the medicines entirely free. Currently this programme called ‘Rajeev Gandhi Arogya Yojana’ treats over 50,000 patients per month. This is considered as India’s largest primary healthcare programme by the private sector. Concept of Health City: Narayana Health city was Conceptualized six years ago by creating a conglomeration of hospitals in one campus with a 1000 bed heart hospital called Narayana Hrudayalaya, 500 bed orthopedic hospital called Sparsh Hospital, 300 bed eye hospital with the infrastructure to perform 500 cataract surgeries everyday and 1400 bed cancer hospital a joint venture of Narayana Hrudayalaya with Mrs. Kiran Mazumdar of Biocon. Projects in the making are a 500-bed Neuro hospital, 500-bed kidney hospital and a women and children hospital. Together they will make a 5000 bed and once the entire health city is commissioned, we believe that the cost of healthcare should come down atleast 50%. Recognization of our activities: Three years ago Harvard Business School chooses Narayana Hrudayalaya as one of their case study and this is one of the most quoted case studies in healthcare industry. The Late Sri Charmakki Narayana Shetty, founder, Shankaranarayana Group of Companies (SNC), was a man with a vision. Having established his group in the field of construction with expertise in dams, roads, highways and power projects in India, the onus to give something back to the society started it all. He found his noble cause taking shape through Asia Heart Foundation (AHF), a non-profit charitable organization founded by a group of heart specialists to establish high-tech hospitals in developing nations. 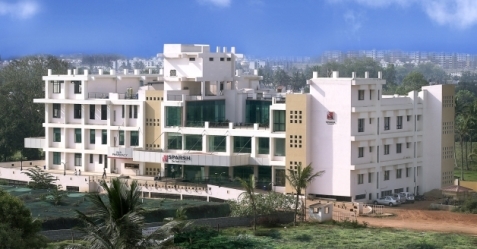 Apart from assisting in commissioning the BM Birla Heart Research Institute, Kolkata in 1989, and the Manipal Heart Foundation, Bangalore in 1997, the AHF decided to promote its own hospital in Kolkata, the Rabindranath Tagore International Institute of Cardiac Sciences (RTIICS) in 2000. The AHF went a step further in realizing the potential of Bangalore being the healthcare destination of Asia by creating Narayana Hrudayalaya, a first-of-its-kind cardiac care hospital. Today, Narayana Hrudayalaya provides complete, expert and holistic treatment to the millions of afflicted individuals in need of treatment by experts at an affordable cost. Health care services spread across Cardiac, Neuro, Specialist Paediatric Care, Organ Transplants, Gastroenterology and much more. Narayana Hrudayalaya has been pioneering affordable and innovative health services in the country for some time now. However, in a country riddled with numerous health and health care issues, every effort seems but a drop in the ocean. But does that mean we stop trying? At Narayana Hrudayalaya, we believe the need of the hour is to create a viable platform for health care givers like us to share, learn, understand and extend the services to the needy. The Continuous Medical Education program is one such Platform to empower the practitioners in the peripheries. This initiative of Narayana Hrudayalaya will attempt to bring to you a series of seminars on different health issues every quarter. With this endeavor, Narayana Hrudalaya hopes to launch a forum, which can spearhead change and bring about immeasurable benefits to the doctors & man in need of safe, informed, viable health practices and care. 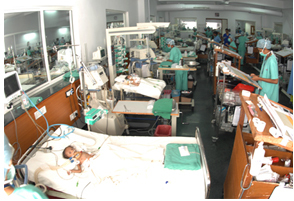 India is a country with the highest number of young heart patients. While in most developed countries the average age of a patient may be 65, here it is 45. Similarly, the most numbers of babies with heart problems are born here. Ironically, even though India has the largest number of medical people in the world, the doctors per 10,000 people is a dismal 48. Which means, proper healthcare is out of reach for most people. It is more true of rural India, whereas urban India has more private hospitals, which come at a cost. Narayana Hrudyalaya is focussed on removing these abysmal disparities, putting technology to good use as well. So here are an amalgam of the best doctors, world-specialists with most number of surgeries to their credit, caring, spreading cheer. He has done specialization at Seth G.S Medical colleger & King Edvard Memorial Hospital,Mumbai. 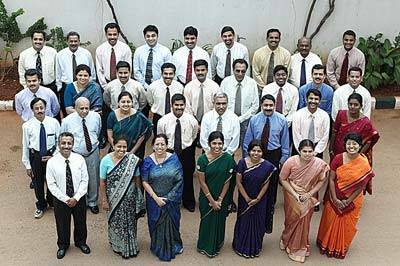 Bangalore: Narayana Hrudayalaya became the first hospital in the State to receive accreditation from the National Accreditation Board for Hospitals and Health Care Providers (NABH) for the delivery of highest quality of patient care. Hospital Chairperson Devi Shetty received the accreditation, instituted by the Quality Council of India (QCI), from Governor Rameshwar Thakur in a simple ceremony at Raj Bhavan. Later, talking to presspersons Giridhar J. Giani, Secretary-General of QCI said that it has stipulated stringent patient care standards to validate the quality of care through compliance assessments against 100 stipulated standards. The emphasis of the standard is on patient care, patient and staff safety, control and prevention of infection in hospitals, special care for disabled group of patients and continuous quality improvement. Narayana Hrudayalaya is the eighth hospital in the country to get QCI accreditation. Mr. Gyani said the QCI team had inspected the hospital thrice to check adherence to all the standards set by the board. To provide the best in contemporary eye care and to create an institution of a standard which will serve as a benchmark in the international community. The hospital caters not only to routine eye problems but treats patients with complicated eye diseases too. Since most of the eye surgeries are done by modern techniques, hospitalization is not usually needed. But if hospitalization necessary, appropriate facilities are available.